F.J. Bergmann frequents Wisconsin and fibitz.com. She has no academic literary qualifications, but hangs out a lot with people who do. Publications where her work has appeared include Asimov’s Science Fiction, Eschatology, Mythic Delirium, Strange Horizons, Weird Tales, and regular literary journals that should have known better. She is the editor of Star*Line, the journal of the Science Fiction Poetry Association and the poetry editor of Mobius: The Journal of Social Change, online at mobiusmagazine.com. Chapbooks include Constellation of the Dragonfly (Plan B Press, 2008), Aqua Regia (Parallel Press, 2007), and Sauce Robert (Pavement Saw, Press 2003). Out of the Black Forest is forthcoming from Centennial Press in 2012. One of her pseudopodia can reach all the way from the bedroom to the refrigerator. Her hairstyle is deceptive. Meaning is more than what’s found in the dictionary. Words carry emotional weight, too, which is more difficult to describe. Saying “the word Ostensible has a negative connotation” or “implies dishonesty” is true, but incomplete; it doesn’t describe how it feels to suspect a ruse. At least not in the same, visceral way as “a hungry dog who/ says I won’t bite/ one two/ many times.” It doesn’t get at the motivation for duplicity quite like “the drooling memory of meat” or the character of a deceiver who “dare[s];/ to pluck the leaf of strife.” So it’s fitting that Bergmann patterns her poem on a dictionary listing, but avoids the actual word roots in favor of associations. She’s investigating the possibilities. This poem is an investigation of meaning. Journalists do similar work then describe what they find in print. 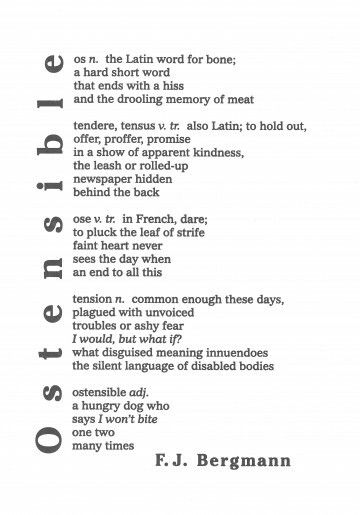 The typefaces used by the paper of record therefore made a perfect match for this poem. The New York Times uses Cheltenham for headlines and Imperial for the body of each article. The poem’s title is stretched out, so that the letters begin to lose touch with each other, losing a bit of legibility and therefore meaning; it’s a word breaking into its parts.